It's important for anyone who has diabetes to exercise regularly. Exercise helps reduce the body's need for insulin by keeping weight down. It also increases the body's sensitivity to insulin, so glucose is used more effectively. You should try and get around half-an-hour of moderate exercise each day. It's important however that you consult with your doctor before embarking on a fitness programme, as some forms of exercise might not be suitable for your condition. Your doctor will give you advice on how to adjust medication, and the best times when and how to take exercise. Once you've been given the go ahead to start exercising, you'll need some guidance in ensuring your exercise sessions are as safe as they can be. Don't make a secret of your diabetes. If you get injured or suffer sudden hypoglycaemia people who may come to your aid need to know you take insulin or that you are a diabetic. Tell your instructor beforehand, and wear a medical ID bracelet, or sports band ID when you are exercising. Choose a type of exercise you are going to enjoy, and one that fits into your daily schedule. 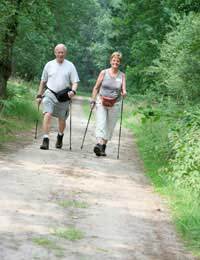 Choose an exercise of moderate intensity like walking, light cycling, or swimming. Try and avoid high intensity exercises such as weight training, running, or tennis. Have someone with you when you exercise. You may need help if your blood sugar drops to an unsafe level. Wear appropriate clothing. Loose fitting breathable garments are ideal. Exercise at the same time and for the same duration each day-if possible. This can help keep your blood sugar levels in the same range. If you want to increase your exercise, only increase the intensity, or time spent exercising by small amounts. Avoid exercising at times when your blood sugar level is low. Don't exercise if you feel unwell or are suffering from flu etc. Exercise can affect your blood sugar, so closely monitor your levels before and after you exercise to measure the effect exercising has on your body. Always have a fast acting carbohydrate food with you during and after exercise (raisins, juice etc) in case hypoglycaemia symptoms occur. Low blood sugar symptoms can occur up to 24 hours after exercising. Drink extra liquids during and after exercising to prevent dehydration. It also helps prevent erratic blood sugar levels and combats heatstroke. Exercise lowers blood sugar, so you may need to eat extra food, or adjust your medication accordingly. Wear proper fitting shoes and cotton absorbent socks. Check feet daily for any signs of pressure sores or friction, blisters, etc..
For longer exercise sessions make sure you take extra carbohydrate snacks during the session. If you experience hypoglycaemia, you should see your doctor. You may be advised to adjust your medication on days that you exercise. Get fit, but stay safe!